Fifty years ago, on May 15, 1961, a new religion was born when the Universalist Church of America and the American Unitarian Association merged to form the Unitarian Universalist Association of Congregations. Unitarians and Universalists were religious liberals who had developed very similar theologies, principles, and social visions over the years. "Since Hosea Ballou made Universalism unitarian and Ralph Waldo Emerson made Unitarianism universalist, there has been no real reason for their separate existence," said Reverend Donald Szantho Harrington in his sermon for the consolidation service. 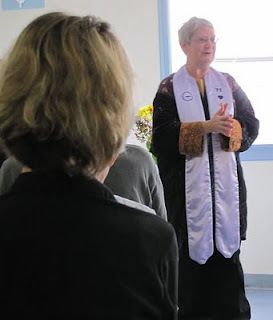 While it wasn't planned purposely, the Brockport Unitarian Universalist Fellowship celebrated its Charter Sunday on May 15, 2011, the same day as the birth of the UUA 50 years previously. This seems synchronistically miraculous to me and a very propitious sign of great and mighty things to come out of the Brockport Unitarian Universalist Fellowship. You can learn more about BUUF by clicking here and about the UUA by clicking here.